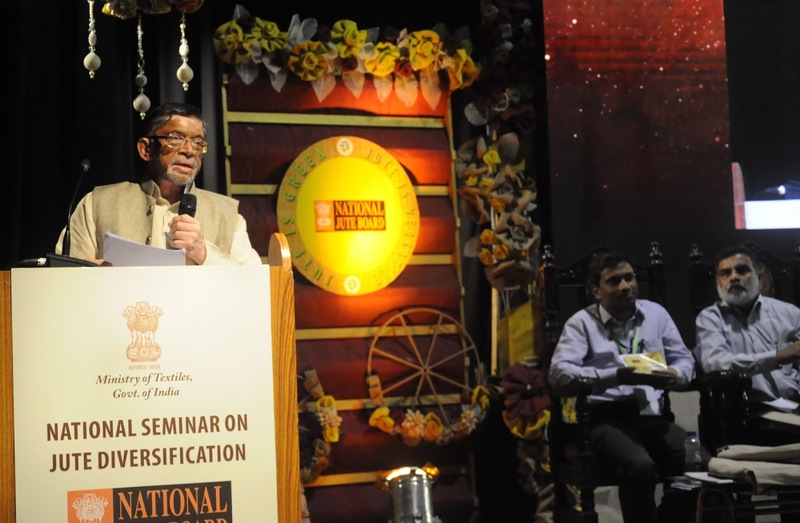 The Government is making all-out efforts to combat pollution by promoting jute products and encouraging people to use them in their day to day life, said Shri Santosh Kumar Gangwar, the Union Minster of State for Textiles (I/C). Inaugurating the “National Seminar on Jute Diversification” in Kolkata today, the Minister said that unlike plastic, polythene and other synthetic materials used in carry-bags and for packaging, jute is biodegradable, environment friendly, natural, non-polluting and non-toxic. Shri Gangwar informed that jute farming and jute-based industry is a major agro-economic activity in eastern and north eastern India which provides livelihood to more than 40 lakh jute farming families, 3.70 lakh industrial workers and 2 lakh people working in the decentralized Jute sector. The Minister said that 95% of jute, known fondly and popularly as the ‘Golden Fibre’ because of its versatility and eco-friendly properties, is utilized for preparing gunny bags for packaging of food grains, as mandated by Jute Packaging material (JPM) Act. He added however, that Government is now giving emphasis on promoting diversification in use of jute, for preparing shopping bags, carriers, office folders, wall hangings, holders, stationery, gifts, handicrafts accessories, jute sculptures, ornamental and fashionable items, footwear, clothes and puppets, Home furnishings and Décor, Frames and Key Hangers, Lampshades, carpets and table runners, Rugs & Curtains, handicrafts, beach bags, clutches & totes, cases & water bottle holders, pouch bags and hand bags etc. Shri Gangwar said that given the labour intensive nature of the preparation of these materials, the Ministry of Textiles is vigorously trying to rope in Women Self Help Groups (WSHGs); he said this would also go a long way in making them self-employed, economically self-dependent and empowered. The Minister further added that, his ministry has already initiated the process of collaboration with other ministries, banks and State governments to link the jute diversification efforts with ‘Pradhan Mantri Jan Dhan Yojana’. He said that skill development centres and Jute Diversification project units have been set up and these will be linked with the ‘Skill India’ initiative of the Government. The Minister also recalled that 427 crore rupees has been earmarked for Jute Geo Textile initiative; he said that this will immensely help in preventing soil erosion as well as mulching on barren lands, and in preservation of roads, embankments and railway tracks. Shri Gangwar said five Common Facility Centres (CFCs) have been set up and are functional in West Bengal, Assam and Bihar, where members of WSHGs are being given training and are engaged in production of diversified Jute Products; he said that ten more CFCs would be set up very soon. Among others, Shri Babul Supriyo, Minister of State for Urban Development, Housing and Urban Poverty Alleviation; Smt. Rashmi Verma, Secretary, Textiles and Chairman National Jute Board addressed the seminar. Shri Gangwar also inaugurated an exhibition on Diversified Jute Products on the occasion. Several experts on jute cultivation, processing, production, marketing and training as well as representatives from National Institute of Design and National Institute of Fashion Technology also participated in the one-day seminar.